(Corky Siemaszko – NBC News) On Dec. 18, 2001, a desperate North Carolina dad wrote a letter to the Vatican asking the leaders of the Roman Catholic Church to discipline a group of priests at a Pennsylvania boys’ boarding school who he said took turns sexually abusing his teenage son. 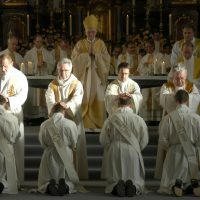 The priests were members of an organization called the Society of Saint John, the father wrote, and Bishop James Timlin, then the head of the Diocese of Scranton, had allowed them to take up residence at St. Gregory’s Academy in Elmhurst, Pennsylvania. “How long will the Bishop of Scranton tolerate this Society of Priests and promote them and their plans?” the father, whose name NBC News is not disclosing to protect his son’s identity, asked in the 2001 letter.